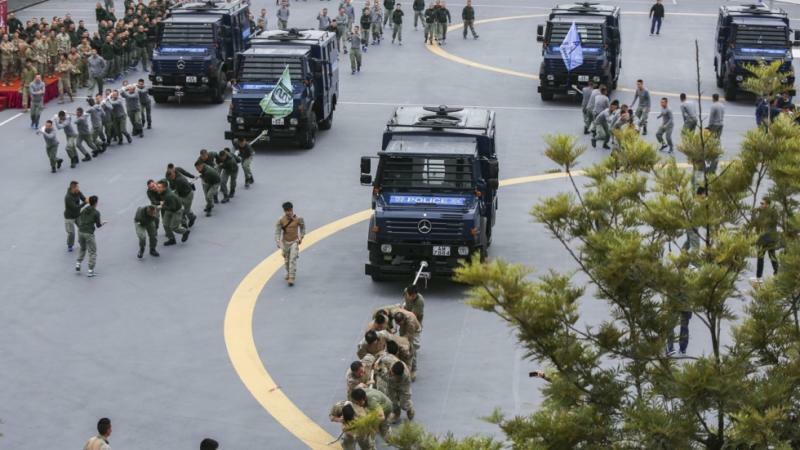 For the last couple of years, the various segments of the HK Police department have pulled their armored UNIMOGs in a race against each other. I think that the 'Special Duties Unit' have won both (or all three?) years. Last edited by TRUKTOR; 04-09-2019 at 08:05 PM. Still faster than a 406 is supercrawler at idle! Those boys obviously know how to have some fun. These, in the day when heaven was falling, The hour when earth's foundations fled, Followed their mercenary calling, And took their wages, and are dead. Their shoulders held the sky suspended; They stood, and earth's foundations stay; What God abandoned, these defended, And saved the sum of things for pay. The local news has been critical of the Hong Kong PD regarding their Armored (Centigon) UNIMOGs. It seems that they have only used them for training and ceremonies. When there was a riot, they stayed parked. Interesting note is that the body can be electrified, to shock anybody that touches it, and they are "equipped with powerful sonic capability". ...my 416 has pretty powerful sonic capabilities too....after driving it for a few hours. And yet I'm sure if they rolled the paddy wagons out every time there would be never ending articles about how aggressive the overly militarized fascist pig police are being oppressive to the proletariat etc. Either you want them to stop the riot or you want them to contain it, can't have both. Hong Kong exists as a semiautonomous zone within the PRC, the PRC wisely realized if they wiped away everything they had in terms of laws and rights it would cause a serious shitshow and even more importantly sour western purchasers of HK sold goods that are made literally just over the fence in Guangzhou. That said I would gather that the article we read would probably be the most critical we'd see in the open press. Calling shenanigans is not widely looked upon as a great move but calling out corruption in defense of that state can be with the right tact. At 30 million HK dollars for 6 Centigon UNIMOGs, that puts them at HK $5,000,000 each. At today's rate, they come in at $637,525 USD. I could see some valid complaints if they have not ever been put into action. I tend to think that the Riot Fence might be electrified, rather than the whole UNIMOG, but who knows? Last edited by TRUKTOR; 04-12-2019 at 09:12 AM.